Founded in 1977, Harbor Freight Tools is a discount tool and equipment retailer headquartered in Calabasas, California, United States. The company was launched by Erick Smidt and his father Allan Smidt, both dedicated entrepreneurs and businessmen. Initially, the company was known as Harbor Freight & Salvage and mostly did business via mail order. In 1980, the company changed its name to Harbor Freight Tools after opening its first walk-in retail store in Lexington, Kentucky. Five years later, Erick Smidt assumed the role of the company president until 1999 when he became the CEO. Through its rigorous growth strategies, Harbor Freight Tools has grown to over 500 retail stores in 46 states. In addition, the company has over 7000 tools and related products and over 11000 employees. Its success lies behind opening new stores and acquiring weak ones from its competitors. For instance, Harbor Freight Tools is known to have acquired US General, a renowned mail order, and equipment company. In 1997 the company began taking orders online at HarborFreight.com, and is now one of their primary drivers of revenue, which was $2 billion in 2010. The site had over 43 million unique visitors in 2012. The site is particularly popular because it offers so many deals and discounts. You can easily claim these by using one of our Harbor Freight Tools coupons, which we update whenever new offers become available. All of Harbor Freight's products are branded in-house, which allows them to compete with the price points of well known brands sold elsewhere. They have a quality assurance facility in Calabasas that ensures their products are of the highest quality. Their product range is divided by US General (storage solutions), Central Pneumatic (pneumatic tools and parts), Pittsburgh Pro (standard hand tools), and Chicago Electric (power tools). At Harbor Freight tools, you can buy a variety of products ranging from material handling tools, lawn and garden tools, hand tools, automotive tools, air tools, engine and generator tools, welding, and many others. 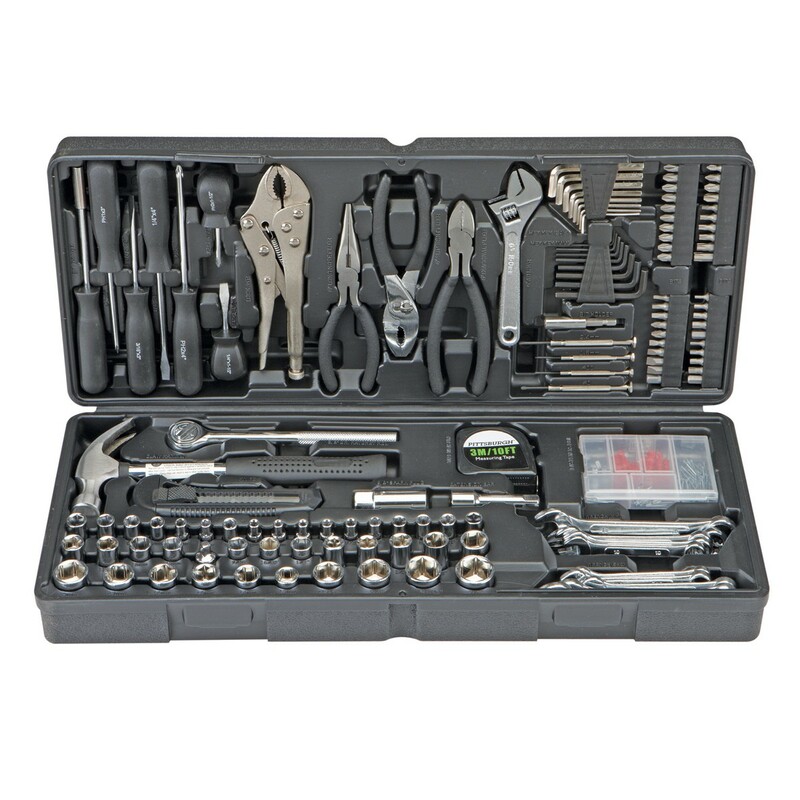 Under each of the above categories is a variety of tools with their specific details and prices. Other products include paint, hardware, lighting, security, cables & plumbing, heavy duty cleaning products, pet supplies, assisted living rails and other items, and even kids toys. For convenience you can search the inventory by keyword and catalog item number, and the latest sales are always prominently displayed on the home page. You can also buy gift cards in values ranging from $10 to $500 - the perfect gift for the handy man or woman of the household. Harbor Freight Tools accepts payments through Visa, MasterCard, Discover and American Express. Customers willing to pay through money order, personal check or wire transfer should contact the customer department service. Prior to online payment you should see a special promo box in your cart. 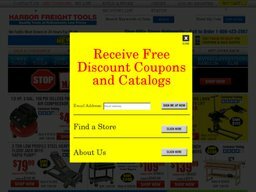 Here's where you enter any Harbor Freight Tools coupon code to apply a discount. Harbor Freight ships throughout the United States and US territories, but international orders are restricted to Canada and Australia. Within the US they utilize a wide variety of couriers, dependent on which best fits your individual order. You also have several options yourself depending on how fast you need the delivery. Standard Ground shipping is a flat rate of $6.99, though oversize items have to be shipped by freight and will cost more. You can also pay extra for Express and Premium options, the cost of which will be fully calculated during the checkout process. Standard takes 3 to 7 business days, Express is 2 business days, and Premium is next day. From time to time you can get standard delivery for free if you use the appropriate Harbor Freight Tools coupon code. For unsatisfied customers, Harbor Freight Tools accepts returns within 90 days of the purchasing date. A full refund or a replacement can be made depending on the customer’s preference. However, it is good to note that a 20% re-stocking fee may be deducted. On return, the customer must present a copy of their packaging slip/invoice with items listed. Before a return is made, a Return Authorization Number should be acquired by contacting the customer service.